Please note – this church caters primarily for the Greek diaspora. Unless set on becoming an Orthodox Christian, one may find it difficult (although by no means impossible) to settle in or to understand much of the service without an understanding of the Greek language. The church building was built in 1901 as an Anglican church. I have come across conflicting information on when it became an Orthodox church – some sources say 1970, others say 1995. This is something that I will look into, and it may be the case that the Orthodox community which now worships at the church was founded in 1970, and bought the building in 1995. 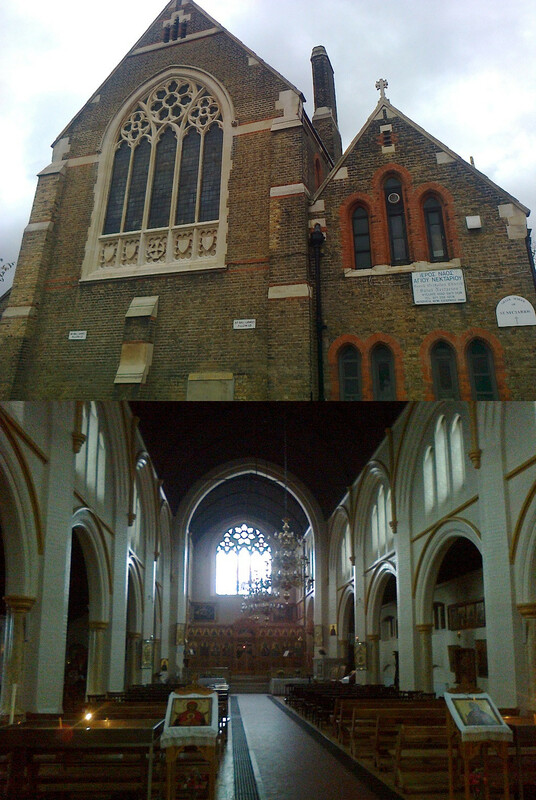 The inside of the church is not quite as covered in icons and frescoes as Sts Constantine and Helen in Upper Norwood, but to say that it is “plain” in any way would be a ridiculous statement. A stained glass window of the Virgin Mary holding Christ flanked by two angels is at the front, and beneath it the altar and iconostasis. Four large metal icons are at the front of the church, two on either side of the way up to the sanctuary – one of Christ, one of the Virgin Mary and Christ, and two of angels. These large icons are beautifully crafted, and interestingly appear to have Russian writing on them, despite being in a Greek church. The walls are, of course, covered in icons of various saints, some of which I was told are reputed to be miraculous (e.g. having been seen to cry). A large shrine to St. Nectarios of Aegina, the namesake and patron of the church, is in the front left corner of the church, surrounded by flowers and smaller icons. At the back of the church is the same arrangement in regards to candles and icons on stands as there was at Sts Constantine and Helen church, and on the back wall is a fresco of Christ holding a cross. In the back left corner of the church is a large stone font. The service was led by a priest in a light blue cassock with a red robe over the top, both vestments with golden trim. There were three chanters – one in a black cassock, one in a suit, and one female chanter. Another man in a black cassock and a few others in suits helped during the processions. The congregation was, unsurprisingly, mostly Greek and Eastern European, although there were some other ethnicities there. Just over half of the congregation was elderly, and there was a roughly even mix of male and female. The bell-ringing during the service to signify the start of the Liturgy proper did not last for as long as it did at Sts. Constantine and Helen, and was also somewhat quieter. Most of the roughly 100-strong congregation had already arrived by the time the church bells rung, although they had still almost doubled in the roughly half an hour since I had arrived. The Bible reading was first chanted in Greek, and then said in English with only the last few words chanted. A lot more of the prayers between the Bible reading and the Eucharist were said in English. A sermon and announcements were after the Eucharist. After the service, the priest stood in front of the sanctuary handing out blessed bread to members of the congregation (as at St. Constantine and Helen). After receiving this, members of the congregation went into a hall accessible through some doors at the back of the church, where more blessed bread was available and a small stall selling various Greek food was situated. People sat down at the tables in the hall, and teas and coffees were served. After that, plates of fruit and salad came out, and then plates of vegetable pasties, and then plates of sandwiches and cakes – I wasn’t entirely sure if there was just a huge variety of snacks to choose from or if an actual meal was being served! Regardless, the food was delicious, and the members of the congregation were very friendly and willing to talk to me about the church.